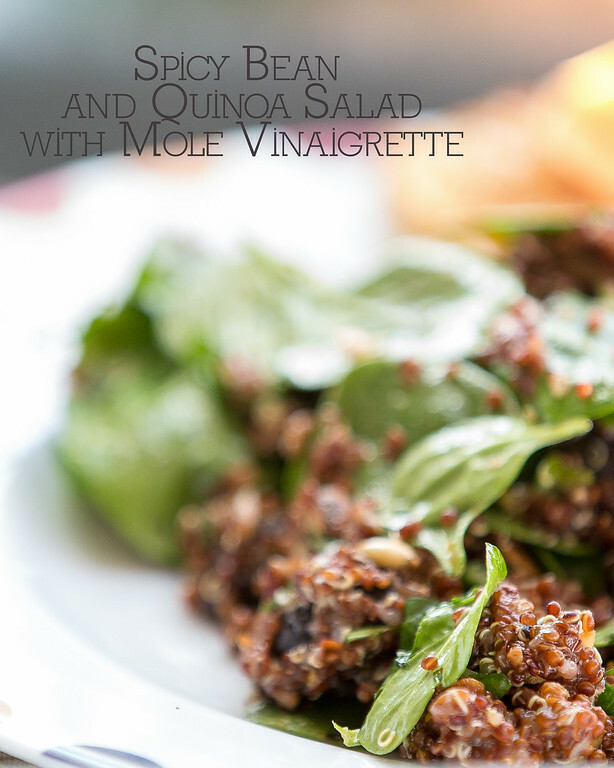 This spicy bean and quinoa salad with “mole” vinaigrette is so unusual and delicious. No one can guess what the dressing is made from! Post may contain affiliate links. I am not a vegetarian. There is nothing I like better than a perfectly cooked ribeye. However, like many of you, I do try to limit my intake of meat. So, an occasional meatless meal works it’s way onto my weekly menu. Let me just say that if all of my endeavors into meatless eating ended like this one, I might give the whole vegetarian thing a little more thought. This was wonderful. It was super easy and the “Mole” vinaigrette gave it such a wonderful flavor. You couldn’t quite tell what the flavor was, you just knew that it was good. I found this recipe at Cooking Light – Spicy Bean and Quinoa Salad with “Mole Vinaigrette. Bean and quinoa bring plenty of protein to this salad, while the "mole" vinaigrette adds spice! Combine first 7 ingredients in a small bowl slowly add oil, whisking as you pour. Combine quinoa and next 6 ingredients (through beans) in a large bowl. Add vinaigrette; toss to coat. Add spinach; toss to combine. This looks and sound delicious! My husband are the same way, we aren’t prepared to completely give up meat, so we try to moderate it, and have fallen in love with a number of vegetarian and vegan recipes. You snuck this one by me last week but I added it to the Souper Sundays roundup today–thanks for sharing. 😉 Your salad looks wonderful–I love the sound of that vinaigrette and it looks so satisfying too. i sure do like recipes with only two steps in the instructions part, and this one is healthy too! awesome! It’s always good to find something a little different for dinner. I think I”d like this as a side. Been meaning to ask if you are an addict of http://www.simonscat.com/ because my daughter is. Today she sent me suitcase. Funny. I somehow missed this salad in the April issue!! Definitely will be trying it!